I recently 'finished' this model that I began 18 months ago and then abandoned. You can find it in the 3D Warehouse here: http://sketchup.google.com/3dwarehouse/ ... 1df6d2aa45 I'd love to know what you think of it. I've already heard from geodesic dome experts that the both greenhouse domes and the fuel cells at the rear aren't correct but I don't currently have the energy to go back and rework them. Last edited by mhtaylor on Thu Feb 24, 2011 2:19 am, edited 1 time in total. Re: Valley Forge: Spaceship from 70's Movie "Silent Running"
I am having flashbacks now. Great model. I remember that movie, Bruce Dern (sp?) wasn't it? Martin, I remember your Huey drone as well. The model even has a 70's movie feel to it. Boofredlay wrote: It was Bruce Dern. That was me; can you tell this movie had a big effect of me as a child in the 70's? I used a lot of reference photos of the original 26' long model when building this model. Unfortunately they aren't that numerous or that detailed so I had to use some imagination too. Hopefully it captures the spirit of the ship even if all the greebies are correct. honoluludesktop wrote: I remember that movie, Bruce Dern (sp?) wasn't it? Well done! You've beat me to it! Definitely one of the cooler spaceships of the 1970s. I loved this movie as a kid. I was about 14 or so when it came out. 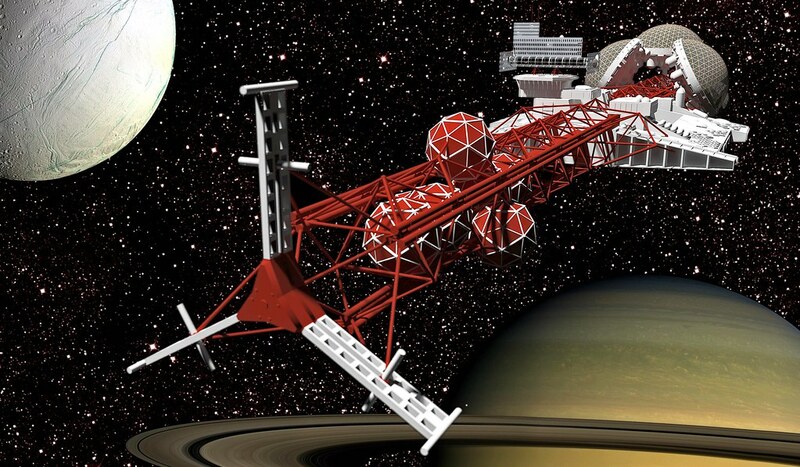 I did a space station in Architecture school that was inspired by this. A space station iiwth a green house dome but my rotated to make artificial gravity. I think Pete did some models of the little robot drones. Huey, Duey and Louie. So tell me. . .you can admit it . . .did you call cry when Louie gets lost? David_H wrote: I loved this movie as a kid. I was about 14 or so when it came out. 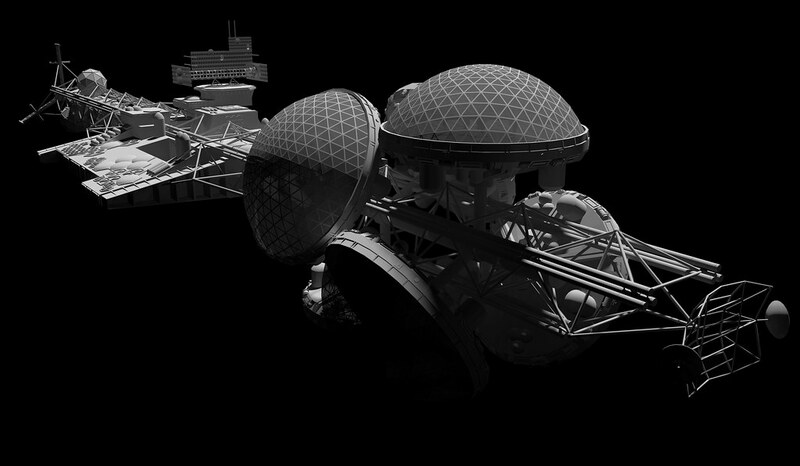 I did a space station in Architecture school that was inspired by this. A space station iiwth a green house dome but my rotated to make artificial gravity. Very nicely detailed. I remember the movie well, haven't seen it in years though. the movie had a strong environmental message as well for the time. . .in order to be green and respect mother nature. . .you have to kill people. mhtaylor wrote: I've already heard from geodesic dome experts that the both greenhouse domes and the fuel cells at the rear aren't correct but I don't currently have the energy to go back and rework them. Taff - it's not you, it's me. I just can't face going back to it right now. It turned into one of those models I thought was going to be easy but contained more details than I ever imagined. Those fuel pods you made are particularly fantastic. If you put either in the warehouse I could incorporate them into the model if you like and you would get credit as a contributor. I apologize if I gave the impression that it's about credit. I certainly don't mind if you use the dome & pod model files I emailed you, to upgrade your model, with or without attribution. I always strive to encourage modelers, by providing geodesic support. That's my "thing." I'm chagrined that you may have taken my emails as criticism. That was not my intent. Taff - I took it in the spirit it was intended. I don't think of the word 'criticism' as a negative one and a value you having got in touch with me and showing me your work. It was certainly more accurate than mine but I didn't want to just incorporate your hard work without permission. Now I have it I will revisit the model. I look forward to seeing your progress, as you refine your model. You may note that I've added your model to my "Geodesic" Warehouse collection. 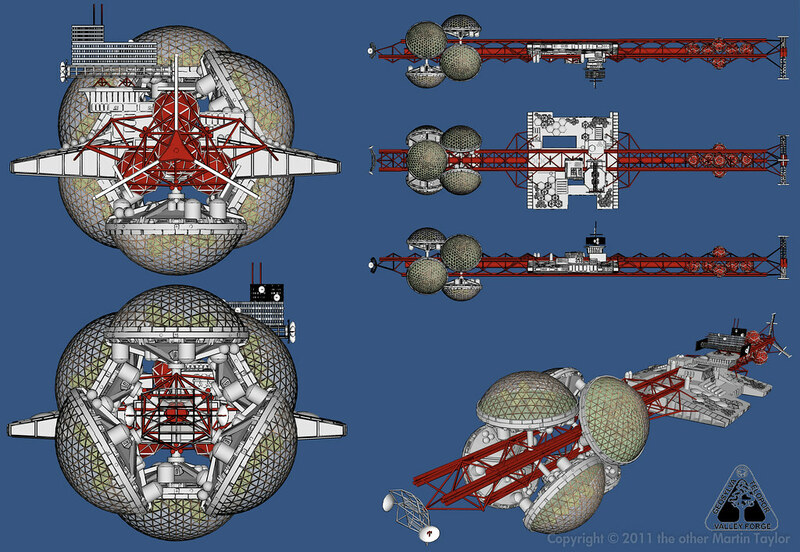 Taff - I have incorporated your greenhouse domes and fuel cells into the model now. It's still in the same place on the warehouse: http://sketchup.google.com/3dwarehouse/ ... 1df6d2aa45 LMK what you think. Here' a quick render from the Twilight plugin with the new domes - unfortunately I didn't get all the materials right for some reason. Im a huge fan of this ship. Im in the process of building a kit of this ship using another mesh. If you looking for info on this ship contact me. 18 months! don't worry man I share your pain sometimes I don't think my Avatar helicopter will ever be finished haha! Good work, excellent model, what size is it coming in at? ill download it when my new computer finally gets delivered, might download it on Wednesday to the work computer on my dinner if i have time.